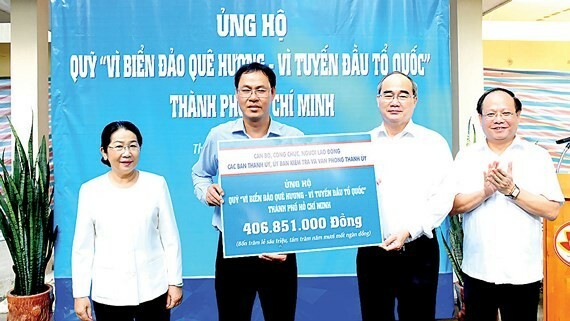 Secretary of the HCM City Party Committee Nguyen Thien Nhan and all committee members on July 23 donated more than VND406 million (US$17,600) to the “Fund for Vietnam sea, islands – the Border guard force”. 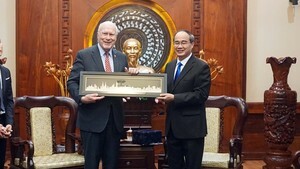 More than VND406 million (US$17,600) is handed over to the “Fund for Vietnam sea, island – the Border guard force”. The support aims to response to a campaign calling on officials and employees to donate one day's salary for people and soldiers who are working and living in islands and border crossings nationwide. The event has been launched by the Vietnam Fatherland Front Committee of Ho Chi Minh City .